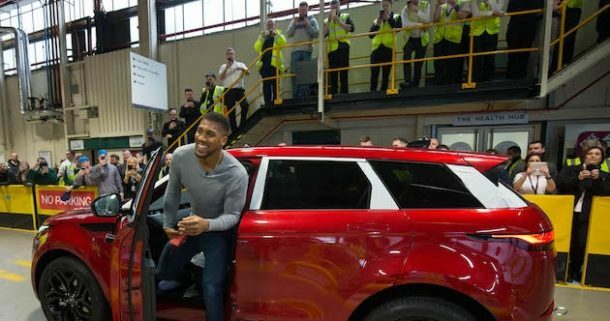 The triple heavyweight champ who holds the WBO, WBA and IBF titles swapped his gloves for gearboxes as he dropped in on the men and women in charge of building the next generation Range Rover Evoque at Halewood. Keen to get his hands dirty, AJ wasted no time in getting stuck in with jobs on the shopfloor and helped workers put the finishing touches to the luxury cars as they were driven off the production line. He also squared up against an unusual new opponent going fist to fist with one of the new robots recently installed at the factory to build the new Evoque – called a Cobot. Finally, with his next big fight around the corner, AJ managed to get some training under his belt by taking part in some sparring sessions with employees who run a local ABC boxing club, who were keen to brush up on their techniques and bag some top tips off the big man himself. During his visit AJ took time to chat to employees as well as pose for selfies with the excited workforce. Stuart Lord, plant operations director at Halewood, added: “The new Evoque is not just hugely important for our plant but also the whole Liverpool city region. The plant has benefited from a £130m investment to support its production, which in turn has helped to boost the local economy and secure jobs. Launched in 2011, the Evoque is the most decorated Land Rover of all time with more than 217 awards, exported to 180 markets, with 725,000 Evoques manufactured in Halewood. Since the first Evoque rolled off the Halewood production line, 80 per cent have been exported – generating an estimated revenue of £17.6bn for the UK. The next generation model, which made its global debut yesterday, will continue to be manufactured at the state-of-the-art Halewood plant with additional production overseas to meet market demands. Building on the original Evoque’s instantly-recognisable design, the new Range Rover Evoque is a sophisticated evolution of the distinctive coupe-like silhouette, typified by its distinctive fast roofline and raising waist that identify the Range Rover family. From 2020, every new Jaguar and Land Rover will have the option of electrification and this new architecture has been designed for hybrid-electric power, with a mild-hybrid option on the new Range Rover Evoque at launch and a plug in hybrid available 12 months later.